Apple doesn’t always go first. It didn’t invent the portable mp3 player - it just gave it an iconic style deserving of the artistry stored upon it. It didn’t invent the smartphone - it merely created the first product that justified the term. And it didn’t invent voice assistants, or self-driving cars, or wearable technology or whatever comes next. It’s that - the whatever comes next - that poses the greatest threat to Apple, even if it seems untouchable right now. From this point on, to stay on top, Apple doesn’t so much have to predict the future, but perfect it. “We’ve moved from a desktop-centric world to a smartphone-centric world,” says Benedict Evans, from venture capital firm Andreessen Horowitz. Now, “we’re really thinking about what comes next”. iPhone sales have stopped growing. That’s normally a disaster for investors, but Apple has stopped it being bad news by making more money from each one. Last year’s iPhone X, at a price of $999, raised the average selling price of the iPhone to $724. So far, so good. But the next computing boom has the potential to make a new company king of the world much like the current one did to Apple. We are now in the smartphone era’s twilight, and Apple may not be in a particularly strong place to succeed with what comes next. “The focus is now cars, glasses, services, cloud, TV - things that aren’t really there yet,” says Mr Evans. 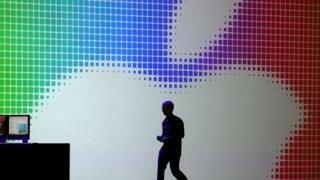 He says the only choice Apple has at the moment, like every technology firm out there, is to hedge its bets. If, as many smart people predict, artificial intelligence and data provide the pillars of the next major platform, some feel Apple might have a weakness. The firm has made a marketing virtue out of the fact it does not collect as much data as the Googles and Facebooks of this world. While I wouldn’t doubt the firm’s principles on privacy, its stance does help cover the fact it may seriously lack the data needed to offer the types of artificial intelligence people are beginning to expect. “Apple will have to figure out how they can deliver without being in control of that data,” says analyst Carolina Milanesi. She says Apple’s issues start with Siri, its often mocked “smart” assistant. “Siri does not seem to retain what she knows about me across devices,” Ms Milanesi says. To do that, Apple would need to adjust its approach to data processing. Instead of keep user data local, on a person’s device, it may have to start sending some information to a far away server. “This might seem to Apple like having to compromise on privacy but it is not,” Ms Milanesi argues. Apple is working on addressing its AI shortcomings. Mr Evans points out Apple’s recent hiring of John Giannandrea, formerly Google’s head of artificial intelligence, as a major coup. The move was heralded by the Financial Times as being like a top footballer defecting to a rival team. “AI defector gives Apple access to Google’s secrets,” its headline read. Some will tell you that the biggest hassle for Apple, in the short term, comes from combination of tides we already know about: Trump-enforced tariffs that could hit its supply chain economics in China, coupled with the growing presence of cheaper rivals from the same part of the world. Huawei, for instance, just overtook Apple on the number of smartphones sold globally. But in reality, neither of those things are likely to significantly impact Apple’s business. For starters, people pay an awful lot more for Apple’s devices than Huawei’s. And any issues stemming from the political climate, analyst Daniel Ives told me, are being seen as “containable risk” by Wall Street. At $1tn, Apple may well be too big to suffer. But you would have said the same about Microsoft in the 90s, when its period of dominance over the computing industry came as a result of perfecting what it meant to use a desktop computer: at work, at school, at home. Times changed. They’ll change for Apple too.